The number of cars built in the UK fell by three per cent in 2017, according to new production numbers. Data published by the Society of Motor Manufacturers and Traders (SMMT) shows that Britain produced 1.67 million new cars last year – 51,532 fewer than in 2016 – while van production also fell by 16.7 per cent. Four of the six car factories in the UK saw a drop in production in 2017, with the exceptions being Honda’s Swindon plant, which enjoyed a 22.4 per cent production boost, due to demand for its Civic hatchback and CR-V SUV. Mini’s Oxford factory also built 3.8 per cent more cars. 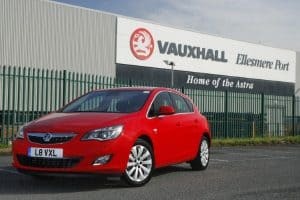 The most significant decline in production was witnessed at Vauxhall’s Ellesmere Port plant (-22 per cent), which now only builds the Astra [pictured]. Not far behind was Toyota’s Burnaston facility in Derby, which took a 20.1 per cent hit to Auris and Avensis production. Despite the three per cent decline in UK car manufacturing, there was a silver lining in the fact that 2017 reported the second biggest output since the turn of the century. SMMT chief executive Mike Hawes gave an upbeat assessment, but suggested Brexit had caused the dip in production. “The UK automotive industry continues to produce cars that are in strong demand across the world and it’s encouraging to see growth in many markets,” he commented. Mr Hawes called for rapid progress on trade discussions to safeguard jobs and stimulate future growth.